Regiment/Catrawd: 13th Battalion Welsh Regiment. Service Rank and Number / Rheng gwasanaeth a rhif: Private No. 16534. Ref No Grave or Memorial / Rhif cyfeirnod bedd: Pier and Face 7A and 10A. Killed in action on Monday 10 July 1916 at Mametz Wood, aged 26 years. Oscar Darby was born in Nelson, Glamorgan, South Wales during 1890. His father was George Darby of Sydney, Australia and his late wife Mary Darby. Nothing is known of his early life, but it appears that he was looked after by his Guardian – Joseph Metcalfe and lived for a time in Bradford, Yorkshire. (nothing further known at this time). In 1915 he enlisted as a Soldier with 13th Battalion, Welsh Regiment at Pontypridd, South Wales and served in France. On 10 July 1916 an attack was made by the Welsh Regiment into Mametz Wood. Despite heavy casualties the fringe of the Wood was reached and bayonet fighting took place before the Wood was entered and a number of German Machine Guns silenced. Fighting in the Wood was fierce. 676 men went into the attack and after a day of hard fighting the Regiment had lost almost 400 men. Private Oscar Darby being one of them. 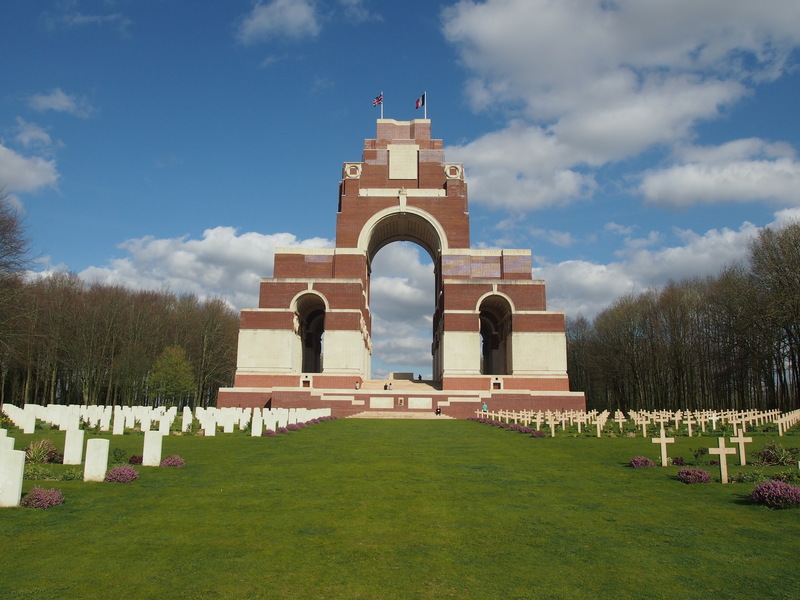 Six other Flintshire Soldiers were also killed in action on Monday 10 July 1916 during the Battle of Mametz Wood, they were –Sergeant 20496 James Congdon and Private 16442 Llewelyn Williams who are remembered on the Rhyl War Memorial, Private 21235 Thomas Charles Jones MM, who is remembered on the Bagillt War Memorial, 2nd Lieutenant James Victor Sinnett-Jones, who is remembered on the Caerwys War Memorial and Lance Corporal 20977 Peter Jones and Private 26433 John Richard Jones who are remembered on the Greenfield War Memorial. 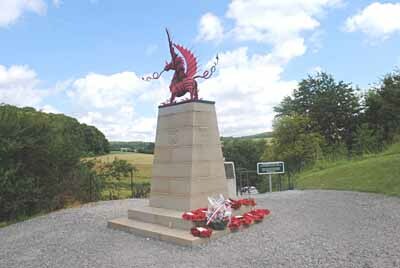 On July 1st 1987 a memorial to the 38th (Welsh) Division in the form of a Welsh Dragon, was placed overlooking Mametz Wood, at Mametz, Somme, France. 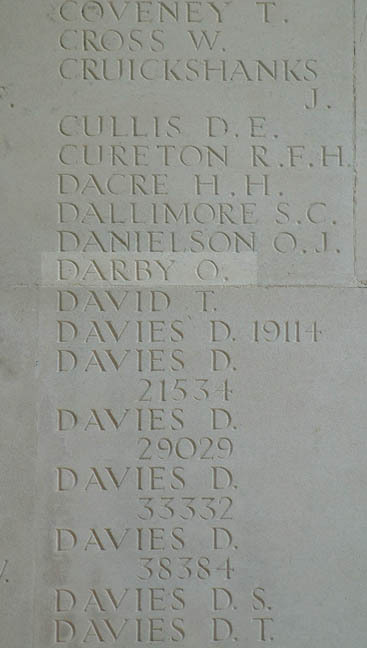 Photograph of Panel Pier and Face 7A and 10A at The Thiepval Memorial of Private Oscar Darby. On 28 January 1920, a payment of £8.0s.0d was made by the War Office to Joseph Metcalfe (Guardian), which is recorded as a War Gratuity. He is also remembered on the Nelson, Glamorgan Memorial Plaque, which was unveiled in 1926 by Major Dowdeswell. The inscription reads ‘ GWELL ANGAU, NA CHYWILYDD’ which literally translated ‘ Better Death, Than Shame’, but the meaning would probably be more commonly translated to the more recognised version ‘Rather Death, Than Dishonour’. There is no Flintshire Roll of Honour Card for Oscar Darby at the County Archives Office, Hawarden.